I had 2 HDDs in Intel Matrix RAID configuration on a motherboard with Intel southbridge ICH9R. I had a RAID 0 (Strip) volume and a RAID 1 (Mirroring) volume (Intel Matrix RAID allows you exactly that: having a RAID 0 and a RAID 1 volume on the same 2 HDDs). Somehow when replacing my videocard I unplugged the power connector from one of the HDDs. When I booted only one disk was showing. So I turned off the PC and correctly plugged the power connector. But now both HDDs where there but showing as "Non-Raid Disk"
Under the BIOS RAID menu (you can enter this menu by pressing <Ctrl+I> after booting) the only choices I had where to create a RAID array, to delete a disk from the array or to reset it. No option to repair/recover/rebuild. I tried many things like clearing CMOS, upgrading/downgrading BIOS version without any result, the disks kept showing as Non-Raid Disk. So I installed Windows on a 3rd disk thinking that at least I’ll recover my data on the mirroring volume. But the mirroring partition wasn’t visible from windows. I tried all the partition recovery programs I could find but none of them could restore the Raid 1 partition. I found one program (DERescue Data Recovery Master) that could recover the files on this partition but not restore it. This was quite surprising because Raid 1 is supposed to be “safe”; if one of the disks is functioning correctly you should easily recover you data. And both disks where functioning correctly. I suppose that’s because of how Matrix Raid works; it keeps the information about the Raid configuration on the first volume and if the first volume fails everything fails. When configuring Matrix Raid the first volume should be the Raid 1 one. So what to do? First, I played it safe and I buyed Data Recovery Master and recovered all my files on the Raid 1 partition. Second, I went to Raid BIOS menu and tried to recreate the volumes using the same parameters as the first time I configured it (three years ago). I knew I had one raid 0 volume and one raid 1 volume but I wasn’t very sure about strip size or volume size. So each time I created the two volumes then used TestDisk under Windows to search for lost partitions then reinitialized the raid array and recreated the volumes with other settings. When using incorrect strip size TestDisk didn’t found anything on “Quick Search” mode. When using correct strip size but incorrect volume size TestDisk managed to find some partitions on the strip volume but nothing on the second. 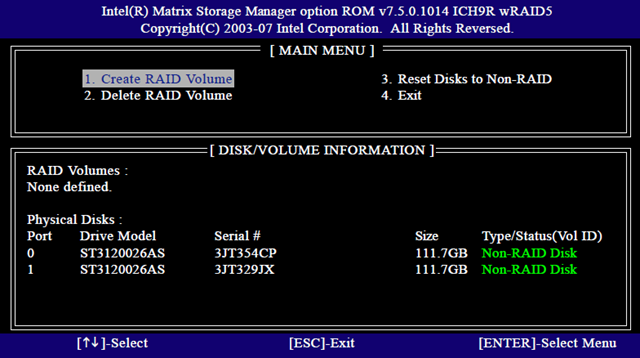 With the right Raid settings it quickly finds all the partitions. All the partitions where now visible but not bootable. I booted the Windows 7 install DVD and I choosed the repair option. It repaired the boot sector and I could boot Windows 7 I had on one of the partitions. Make sure you save your raid settings (strip size and volumes sizes) somewhere where you can find them later if your Raid gets reinitialized. I think that’s pretty readable: we want to change the Title of the element with the ID=1 to “updated title”. For this to work it needs to be executed from an already authenticated SharePoint web page. Internet Explorer automatically passes the credentials with the XHR call. You could pass the credentials in the jQuery call but I wouldn’t do that if I where you. Well, this didn’t work… I was getting some generic SharePoint error page, not very useful for debugging so I fired up Fiddler2. I found out that the response was a HTTP error code 415 – Unsupported Media Type. I noticed some differences between the SOAP request created by jQuery SOAP Client and the SOAP code expected by the service and modified the plug-in accordingly. But I was still getting the same error. Fixing that was simple and… it worked!!! This blog publishes each week a programming challenge they think would appropriate for a programming job interview. In my opinion most of them aren’t very well suited for a job interview but this isn’t the subject of my post. The aim of my post is to solve this week challenge. List of points in a 2D space. If you draw lines between one point to the next one, a closed polygon is created (can be either concave or convex). A single point in a 2D space. You need to determine whether the given point is inside or outside the given polygon. Provide the most efficient and simple algorithm. Problem solved is a few lines of code . But what happens if coordinates aren’t integers or are really big (> 10000) ? This algorithm is not very accurate, we’d run out of memory and filling up a big polygon would take lots of time. Lets draw a ray starting at our point in a random direction to the infinity. This ray intersects our polygon zero or more times. Zero times would mean the point is outside the polygon. One time means the point is inside, two times outside and so on… Even number of intersections means the point is outside, odd number means the point is inside. How do I prove that ? 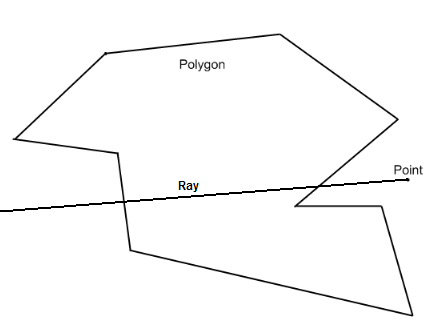 Where Po is the origin point and Pd is a point somewhere on the ray witch gives the ray direction. Where P1 and P2 are the head points of the segment. If we replace (P2-P1) by D (as in Delta) we get the same formula as the ray. Only the limits for the argument are different. First let me warn you that for the sake of simplicity I eliminated input validation code: polygon should have at least three points, segment and ray validation (origin and direction points should be different). The language used is C# 3.0. Did you notice that something changed ? The constraints on u changed from 0<=u<=1 to 0<=u<1. 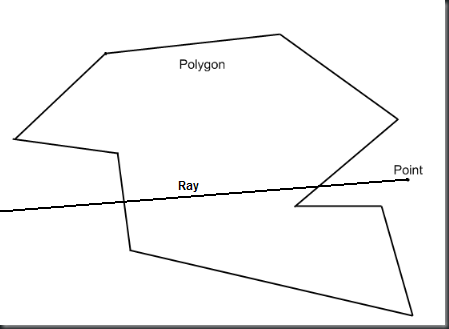 What happens if the ray contains one of the polygon points ? The intersection would be counted twice ! Hence the change. To define the ray we need an origin point (the input point) and a direction point. For fun I choosed the direction point to be the center of the polygon. Any random direction point would work as long as it is different form the input point. So that’s it. There are some ways of improving the code (input validation, test it with very close points, etc.) but I’ll stop here. This is going to be a technical/programming/geek blog; I’m going to write about .NET, software development, computer hardware, digital photography, computer games and other geeky stuff. So, that’s it, my first post. Next step: update the “about” page.